We love to showcase our happy customers. Please send us your photos and we will post them in our customer photo book. We ship via UPS Standard Ground. Cost within the Continental U.S. ranges from $20 - $35, based on your zip code. Please call for rates to additional destinations. Overnight and second day delivery are available for additional charge. 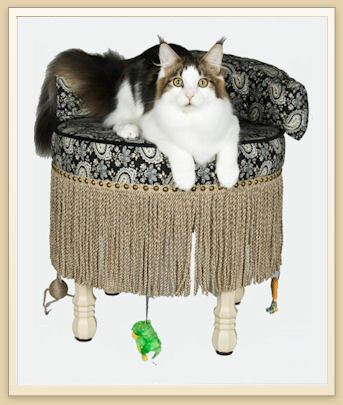 If you are not fully satisfied with your FabulousFelineFurniture, you have 14 days from purchase for a refund, less shipping. Please Note: Fabrics displayed on website are intended to be accurate, but some variation in color may occur. Swatches are available.